Can Your Systems Effectively Clean Residential Solar Panels? Heliotex products keep residential solar panels clean and working their best. 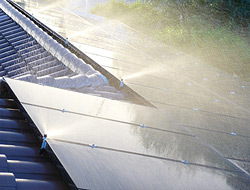 You will find our solar panel cleaning systems at a growing number of homes, and with good reason. More and more owners of residential/commercial solar power systems are recognizing the fact that the cleaner their panels are, the more effectively they can expect their system to run. Our cleaning systems are compatible with panels from the industry’s leading manufacturers, including Sharp, Mitsubishi and more. Furthermore, we offer a selection of anti-theft security fasteners to keep your system safe as it goes about its work. Different times of year offer different challenges in terms of airborne particles, leaves, etc., and all of them can do a number on solar panels that aren’t cleaned consistently. If you’ve installed solar panels at your home, go the extra mile and protect them with a state-of-the-art cleaning system from Heliotex. It won’t take you long after purchasing one of our systems to realize what an effective cleaning tool it is. Many people still clean their solar panels manually, with the end result being a load of effort on their part and a less effective method of cleaning. 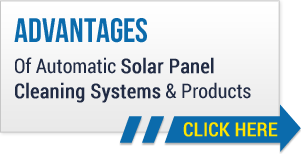 Let us show you the advantages our cleaning systems can bring to your residential solar panels, and learn how much more efficient clean panels can be. We know that you are invested in your solar panels, and that you want and need them to perform at their very best. All solar panels work their best after they have been rendered clean, and an automatic system can do the job more effectively and efficiently. Invest in what's best for your residential solar panels by calling Heliotex today. Heliotex systems make certain the solar panels they're attached to are clean and more efficient at all times. Find the cleaning system that's right for you in our state-of-the-art line of products.